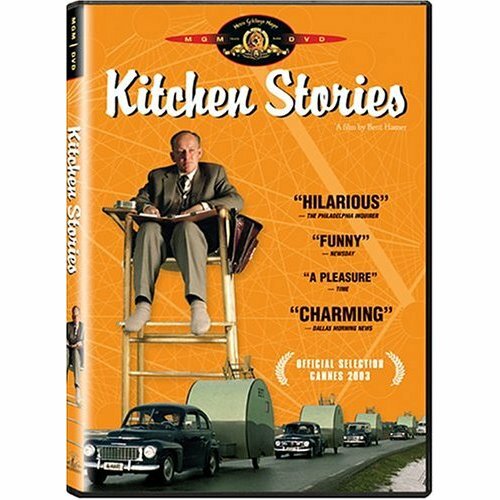 Kitchen Stories is a quiet little gem of a movie that probably flew under the radar of the average film fan. For one thing, it is a foreign film, so unless you speak Swedish (or is it Norwegian?) you will need to select English subtitles on the DVD before you hit the play button. To further challenge the typical American audience, the pace of the movie is measured, contemplative and ultimately highly seductive. If you are a "people watcher", (which is actually the theme of the movie), I defy you to resist coming under the spell and charm of this humorous and intriguing story. Remember those grainy, black and white home economics films from the 1950s? Kitchen Stories imagines the backstory for the data of those films. The setting concerns a Swedish researcher whose task it is to observe and record the daily movements in the kitchen as a home maker cooks and cleans. They collected the data for the women, and now it is time to observe the single men in their kitchens. So Folke, the Swedish Observer, arrives in his company owned trailer to the remote home of Isaak, the Norwegian farmer, to record his daily routines in the kitchen. But this is a scientific experiment, and there are Rules. In order to preserve the integrity of the data, the Observer and the Host must not interact. Conversation and food are not to be shared for the duration of the experiment, which is several weeks. My cardinal rule of movie or book reviews is to never spoil the plot. I do want to provide enough of a taste to whet your apetite for more, however, and I do hope I have succeeded in this case. Kitchen Stories is not a "foodie film" insofar as food per se is not what the film is about. But it is about nourishment, and the inextricable role that food and kitchens play in the humble human drama of communication and connection. Kitchen Stories was an official selection at Cannes in 2003, and deserves an audience. If I were to describe it as a meal, I would say do not expect haute cuisine, but rather something heartwarming, delicious, and substantial that sticks to your ribs... right around your heart.